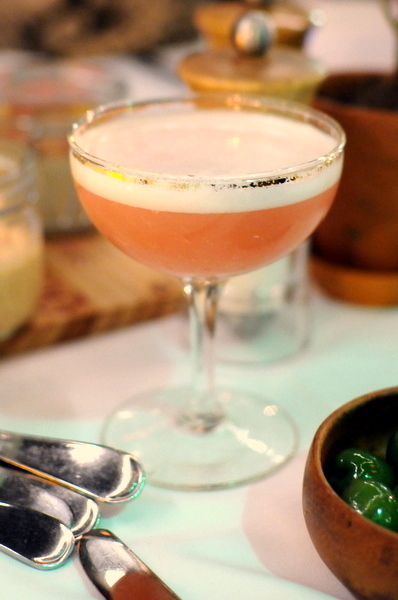 After seeing Chef Ben Bailey's skills on display at Petrossian I knew it was only a matter of time before he grew tired of having his creativity constrained by corporate necessity. 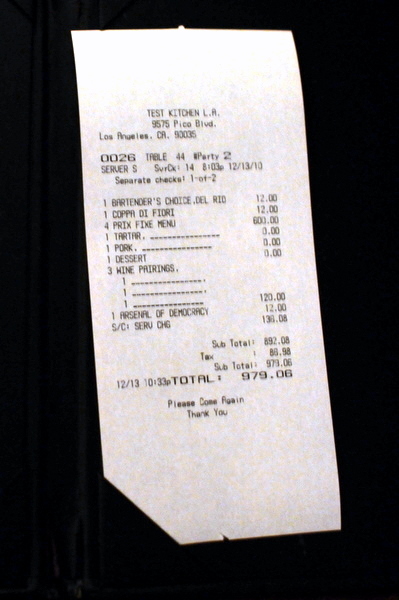 With that in mind, it came as no surprise when I heard the news that Ben left Petrossian for Fraiche in Culver City. 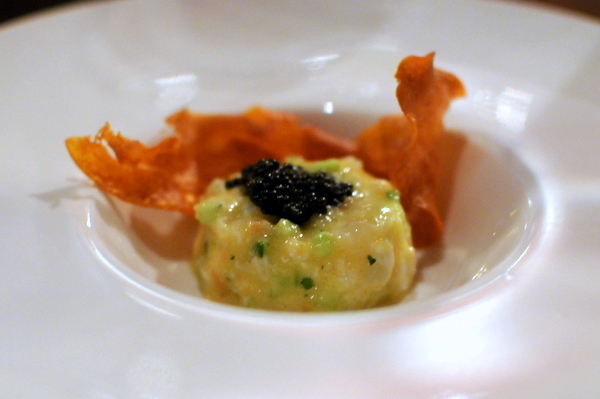 Chef Bailey had built up a strong following among LA's food bloggers while at Petrossian. So when Danny of Kung Food Panda issued an invitation, 17 of us answered the call to try Chef Bailey's brand of rustic French/Italian cooking. 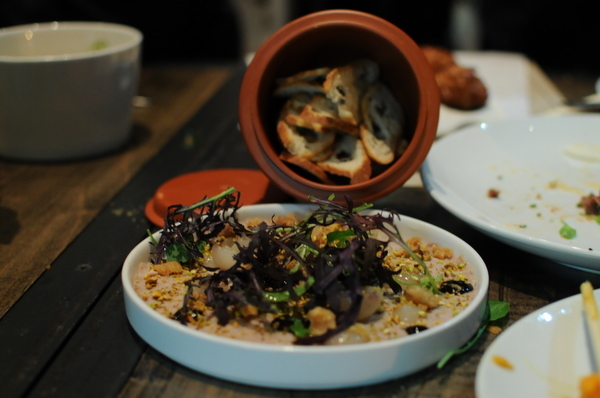 While diners were arriving, a couple of earthenware dishes with olives were placed on each of the tables. 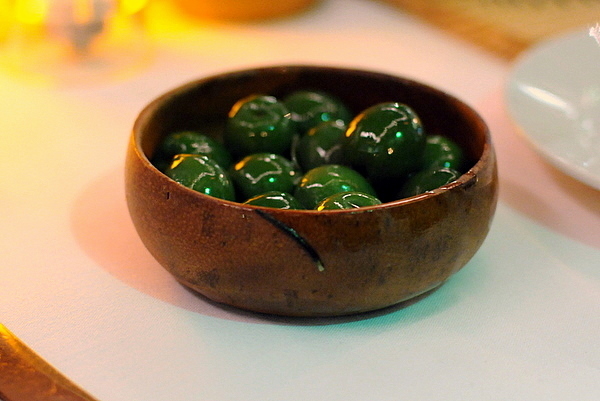 The oil-sheened olives possessed a lush meaty texture and textbook vegetal flavor. Heavily featuring the flavor of pine, this had a sweet menthol grassiness similar to an IPA with some nice texture from the egg white. 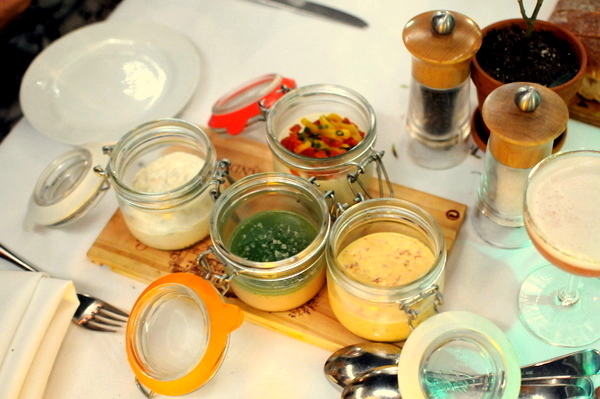 The meal started with of suite of canning jars with disparate fillings for the table to share. Bringing out food family style for a table with six photographers and nine hungry foodies is a recipe for disaster. In the ensuing chaos I was only able to photograph some of the jars. Of the sextet, the chicken liver emerged as the standout, with a richness comparable to foie gras balanced by a nice acidity from the jelly. The remainder aside from the Olivade were enjoyable but sort of blended together in the rush to photograph and taste. Along with the jars, we were brought three more cocktails off their menu. 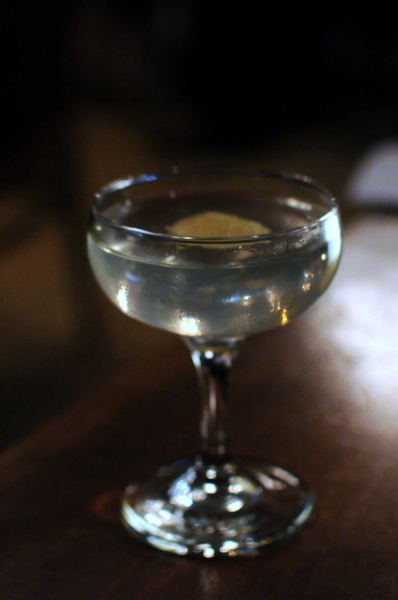 First up was a drink reminiscent of a holiday apple cider the tangy apple vodka is coupled with an herbal spice. This was universally reviled by the table but I found it tolerable. 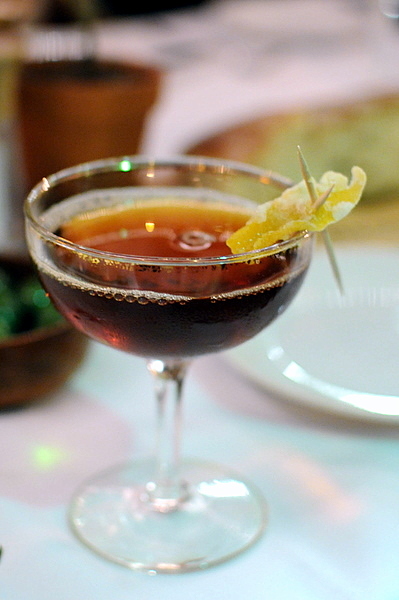 The drink had a strong medicinal burn due to the clove and Cynar that was a bit harsh but not unpalatable. This had everything I was looking for in a cocktail, remarkably balanced, refreshing, and tangy with a hint of spice. Julian joked that "it would have been better hot" would be a common refrain among people blogging this dinner but this was one course that would have been better cold. 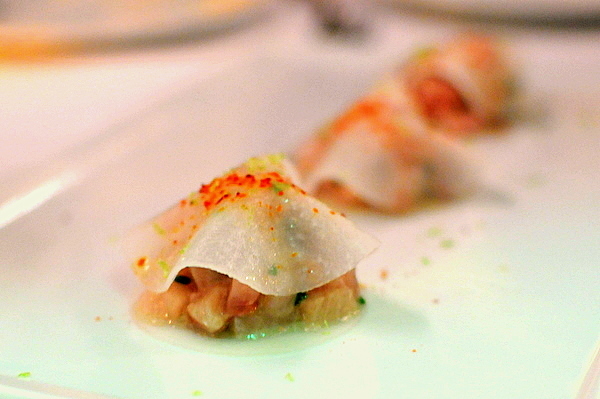 The texture of the fish felt a little softer and fattier which made me wonder if Chef Bailey used belly meat for the tartare. Interesting that we were provided a tonnato sauce earlier in the meal and here we have a more traditional preparation. With a naturally light flavor, the veal serves as more of a textural component, adding a dense muscular chew to build on. I particularly enjoyed the interplay between the fishy smokiness of the tuna and the bitter nutty bite of the arugula. Brussels sprouts seem to have become particularly popular of late. Having the vegetable so many times the past few months, it has started to grow on me though I still find the bitterness a bit much. 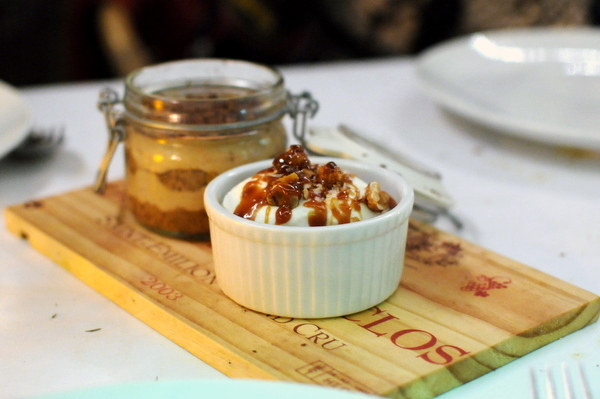 Here the flavor is balanced by the salty punch of the chorizo as well as a the dense sweet dates. The wine was a gift from David Haskell who also happened to be dining at Fraiche that evening. 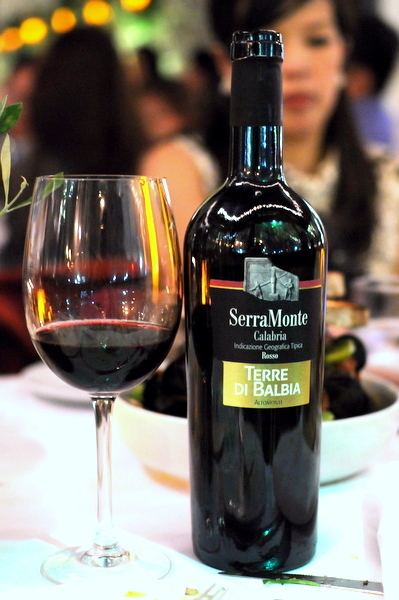 A blend of Magliocco and Sangiovese, the wine carried a heavy perfume of ripe red fruit and berries. On the palate, the fruit persisted joined by a light spice and lush mouthfeel, very enjoyable and easy drinking. One of the weaker courses of the night, somehow the bowl managed to have both overcooked and undercooked mussels. 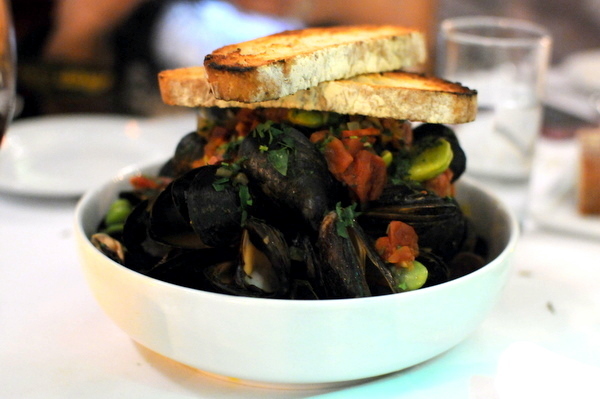 The combination of chorizo and tomato was enjoyable but not enough to compensate for the wildly inconsistent mussels. Easily one of the most unique risottos I've ever had, The basil and tomato give the dish a freshness and levity not found in the more typical cream based variety. 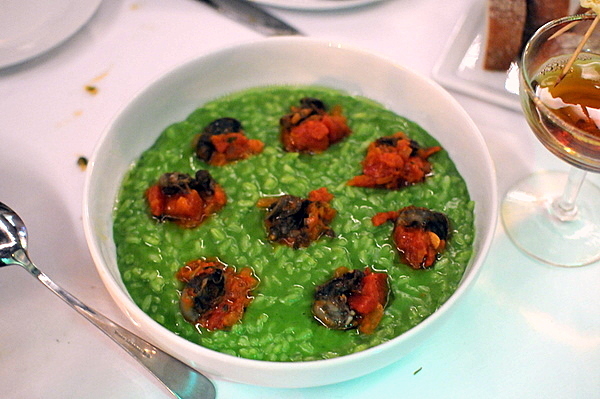 The escargot in risotto was a first for me, adding an intriguing brininess to the mix. Once upon a time, I actually disliked foie gras and it was the seared variety with its unabashed richness that won me over. Since then searing have fallen out of favor, replaced by more restrained preparations like terrines and torchons. 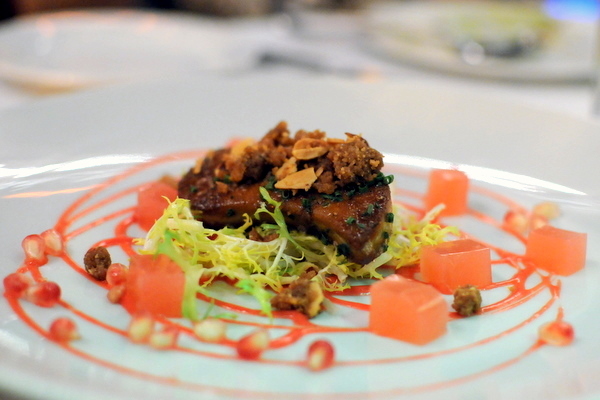 Of late seared foie gras has been making a comeback, paired with bitter or tart accompaniments rather than ripe fruit. Here the frisee and rhubarb act as moderating elements while the candied nuts add both textural variety and a balanced sweetness. 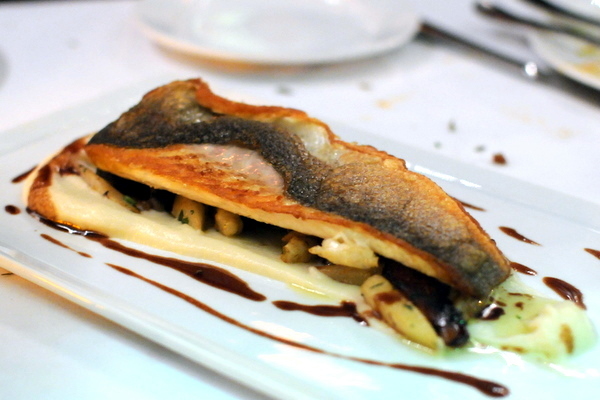 Crispy skin, flaky texture, and a mild salinity enabled the bass to stand on its own or with the earthy mushrooms. 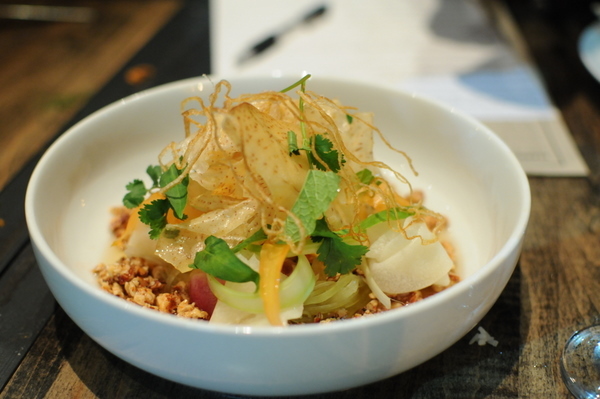 Meanwhile, the crosnes and sunchoke both add a starchy gravity to the dish. Considering his training and background at is predominantly French (Ducasse, Robuchon and Petrossian), it came as a surprise that the pastas were among the strongest courses of the evening. First up was an elegant squid ink pasta with perfectly cooked lobster in a sauce redolent of butter and lobster essence. The weight of the pasta and sauce is deftly offset by the herbaceous basil, tangy cherry tomatoes, and subtle spice on the finish. 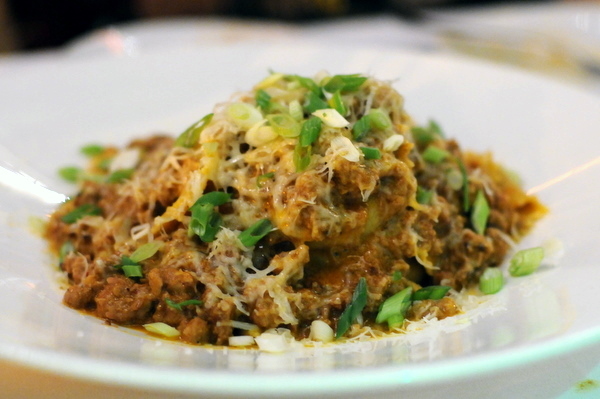 Next up was a perfectly cooked paparadelle topped with a generous helping of delectable lamb ragu. Traditional served with sauces featuring game meats, this thick cut pasta is fast becoming one of my favorites on account of its denser more toothsome texture. 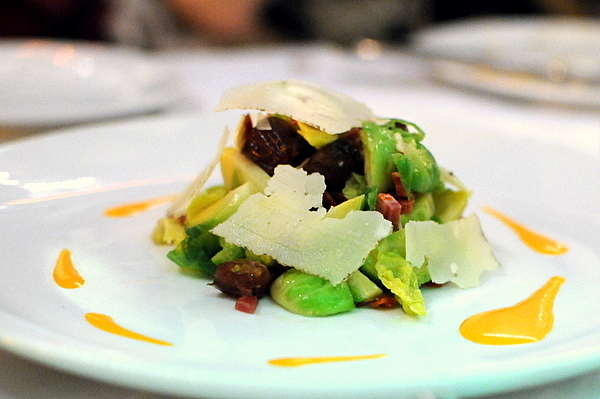 The natural gaminess of the meat is heightened by the olives and goat cheese making for a heavy yet satisfying course. 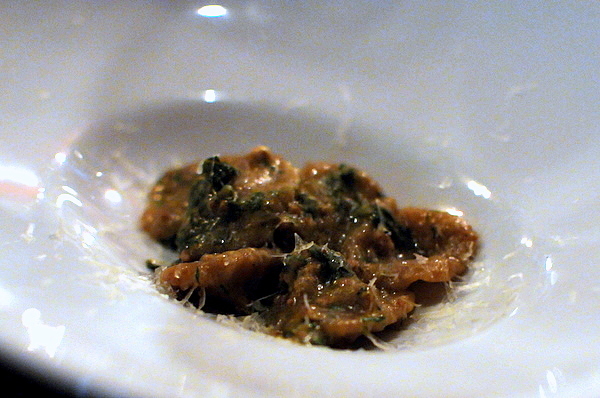 As good as the other pastas were, Chef Bailey definitely saved the best for last. 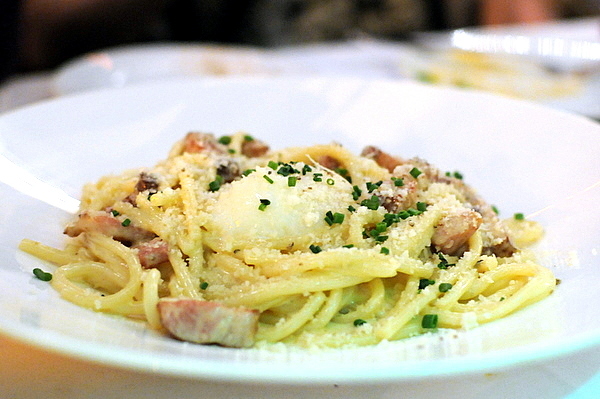 The pasta comes with a quivering poached egg nestled in the center. The flavor is straightforward by delectable, rich pancetta tempered by silky yolk with a liberal dose of black pepper for bite. 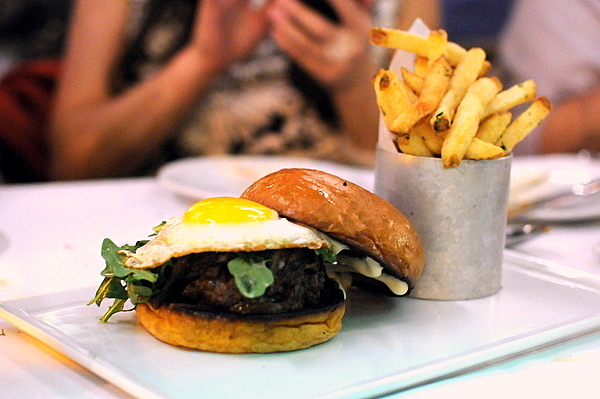 One can never go wrong with a good burger, particularly a burger heightened with the aroma of truffles. The richly flavored beef, sweet onions, and vibrant greens reminded me of a Father's Office burger but with the earthy flavor of truffles and runny egg yolk. Not sure how wise it was to end the savories with a heavy dish like polenta given how full we were. The polenta was spot on creamy and smooth, and it goes without saying poached eggs make everything better. 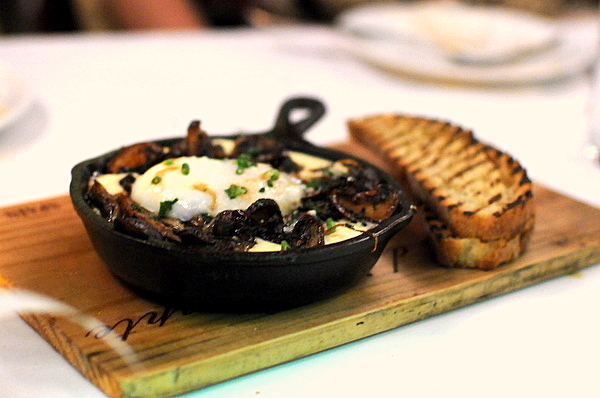 The mushrooms were a touch salty on their own which made sense as the egg and polenta were quite mild on their own. We were faced with another onslaught of courses to start dessert. First up were two pot de cremes and a tiramisu; enjoyable but nothing memorable. A surprisingly restrained chocolate cake, I was expecting something dark and bitter to better contrast the tres leches and almond crumble. Instead the olive oil gives the cake a slightly floral savoriness that still paired quite nicely with the creamy sweetness of the ice cream. 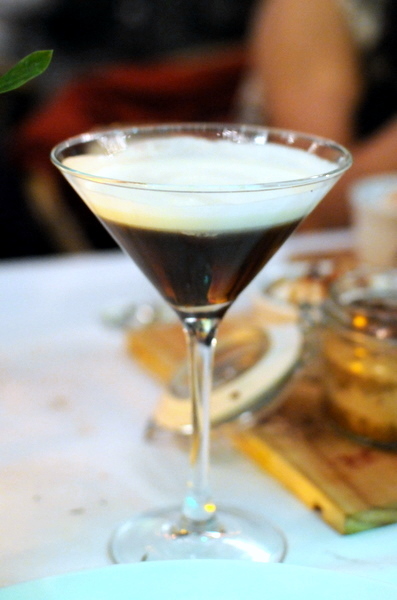 Not sure what makes this deconstructed as I've had layered White Russians before. Still the cocktail was fitting with dessert, offering the satisfying finish of coffee with a bit of kick to it. Unfortunately I don't have enough experience with eggnog to make a relative comparison. On its own the drink had a slight thickness and a faint sweetness reminiscent of almonds and spice. This drink was a bit much for even me. 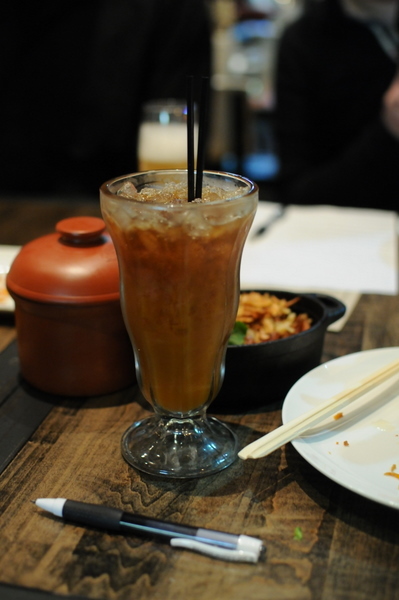 More than one person at the table likened this to Chinese herbal medicine and the heat didn't make it any better. 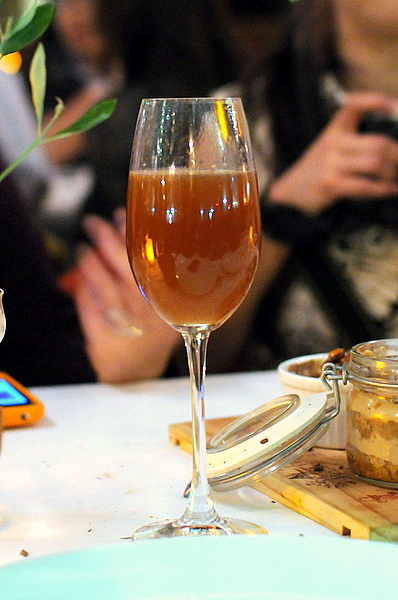 A Hot Toddy might be a good sore throat remedy but I certainly didn't want one after being stuffed to the gills with sweets. I don't normally care for heavy chocolate desserts but this was easily the best of the evening. 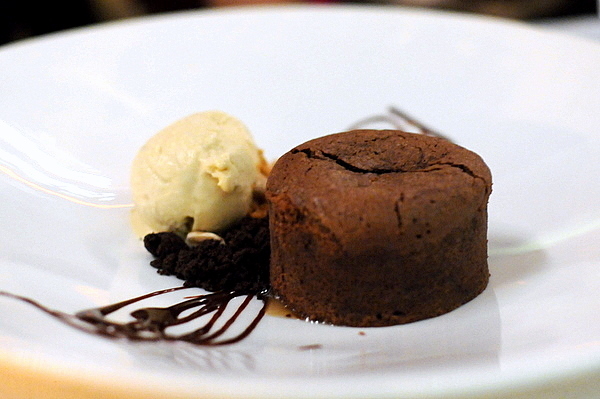 The chocolate coulant (fancy way of saying molten chocolate cake) is a bit overwhelming on its own; the blunt richness is well matched by the equally strong flavors of the toffee and peanut butter. Despite being the only dessert to feature fruit (I somehow missed the key lime pie) this was just as heavy as many of the other sweets. The overall feel was reminiscent of an upscale apple pie a la mode. Immensely sugary, courtesy of the ripe fruit and caramel ice cream though I enjoyed the warm/cold interplay at work between the two. As always Chef Bailey took exceedingly good care of us, the 20 courses ensured we were satiated and provided a comprehensive look at the new menu. As difficult as it was from a blogging point of view, the family style serving makes sense with Chef Bailey's cooking; down-to-earth and approachable, the food certainly reflects the demeanor of its creator. While not as refined as Petrossian, Fraiche's menu emphasizes bold delicious flavors that are better suited to a casual meal with friends. I look forward to returning under less hectic conditions with a smaller group and getting a larger helping of some of my favorites. The only restaurants that I've been to twenty times are places like McDonald's and its ilk. That Test Kitchen can claim as many visits, in three and a half months no less, is a testament to the establishment's allure. 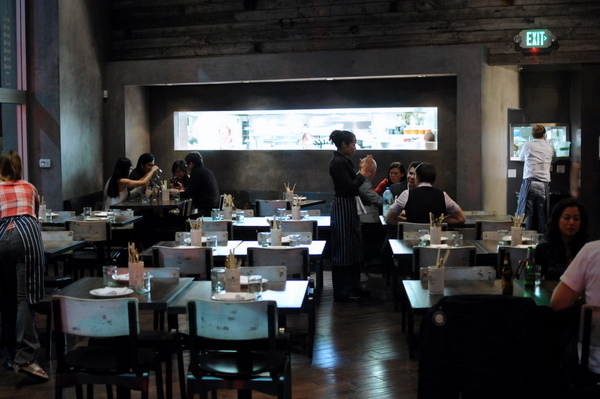 Undoubtedly part of Test Kitchen's appeal is in its impending closure, adding a sense of urgency to each and every visit. To commemorate the final night, a number of the most prominent chefs were invited back for a charity dinner, a fitting capstone indeed. Besides the featured chefs, many others who took a turn behind the Test Kitchen counter showed up to lend their support. Those that I saw in attendance included: Elderoy Arendse, Perfecto Rocher, Alex Reznik, Marcel Vigneron, and Adam Horton. Sadly with all the chaos, I was unable to get a photo of all the chefs at the end of the night. Breaking with tradition, the "secret" Del Rio was our only cocktail of the evening as we tried the rest two days earlier during the black and white truffle dinner. 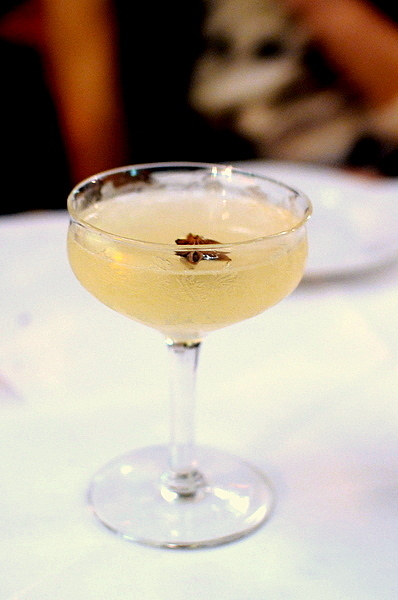 The Del Rio effectively blends the heady warmth of tequila with cool citrus and floral tones from the St. Germain. It seems inconceivable that in 20 visits this is the only course of Chef Zarate's that I've tasted at Test Kitchen, what with him being the restaurants "resident" chef. I expected the ceviche sauce to play a bigger role, but its acidity was muted; balanced by a sweet ginger flavor and delicate nature of the lobster. The tartare felt a bit warm, I suspect that the texture and flavor might have been sharper and more focused had the temperature been spot on. The rosé was fairly typical, floral nose, sweet on the mid-palate with a lightly herbal finish. Next up was a marvelous oxtail consommé, sophisticated and enigmatic, the broth fuses the richness of oxtail with a subtle vegetal sapor. 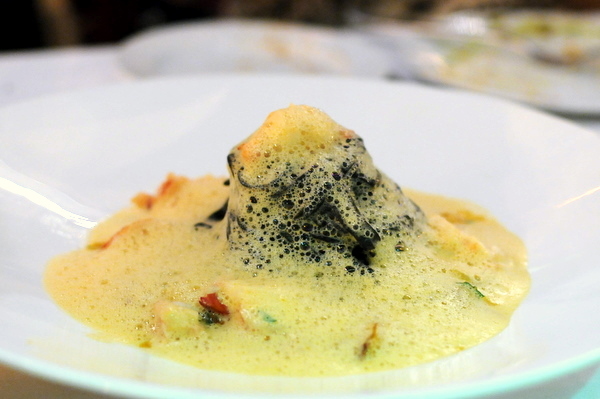 Adding substance to the soup is a quenelle of chicken and black truffle. The chicken might be the most flavorful of its kind that I've ever tasted, on par with the Capon at Guy Savoy, while the pure note of black truffle resonates on the finish with an earthy authority. The pairing was a sweeter Madeira, viscous dried fruit and almonds stand in stark relief to the stately character of the soup. Ever since his first stint at Test Kitchen, Manzke's food has been firing on all cylinders for me and the trend continues here. 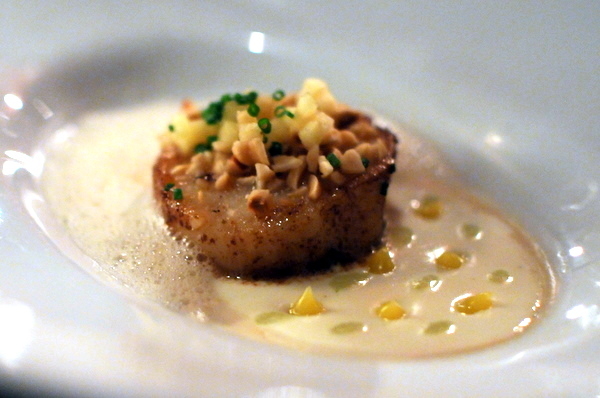 It almost goes without saying that the scallop is perfectly cooked, the browned exterior hides a dense smooth center with an intoxicating sweet salinity. The sauce is composed of a dynamic fusion of apple and cauliflower, acidic and verdant, the two flavors ebb and flow in harmony with one another and the scallop. I've been warming to Chardonnay lately and I though this was an ideal pair for the course. 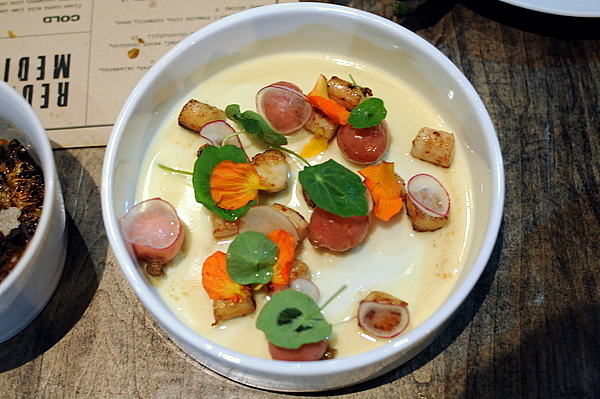 The wine features enough butteriness to play with the scallop as well as a core of grassy minerality that linked to the apple and cauliflower. 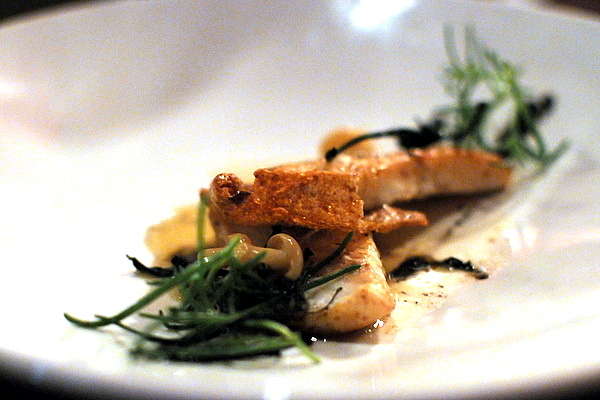 Last time I had Voltaggio's Turbot, he used it to showcase his proficiency with classic techniques. 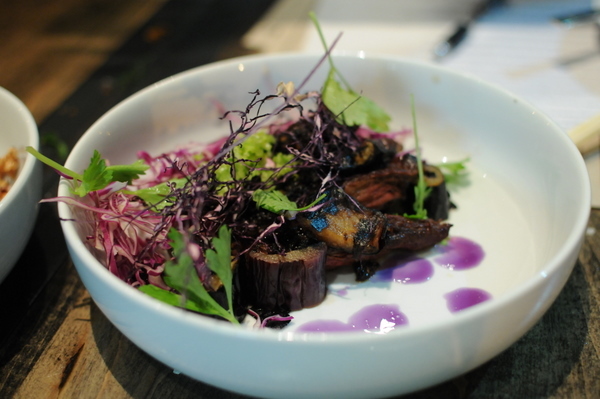 This was a return to his more familiar avant-garde style, highlighted by the use of "ash oil," a dusky earthy mix of cooked down leeks and mushrooms suspended in EVOO. In fact, I assumed "EcoPez" referred to some progressive environmentally-friendly candy, but it turns out to be the name of a company that raises seafood in an organic and sustainable manner. The Turbot itself is cooked in butter giving it a depth of flavor not often found in the relatively mild fish. An unabashedly salty mushroom chip drives the flavor to further heights while the seagrass adds a level of stunning textural grace. The result of this union is simply the most spectacular Turbot I've ever tasted. Scrascinate is a disc shaped pasta from Pugila Italy traditionally made from durum wheat which gives it a distinctive flavor. Though I thought the texture was a slight bit doughy, the flavor was indeed spot-on for this dish. 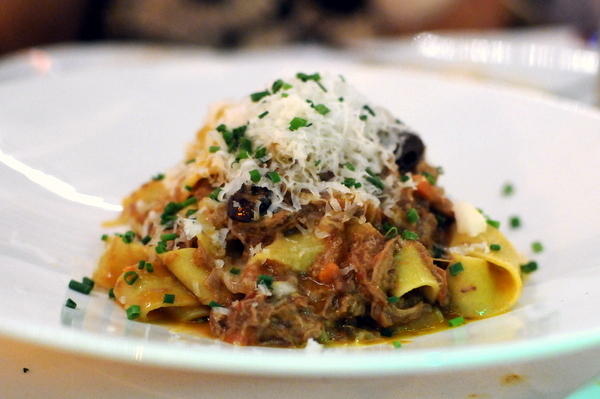 More robust than other pastas, it stood up well to the rustic game of the lamb ragu. Lacking the subtlety of some of the earlier courses, the simple yet expressive pasta is well-suited to the bold Woocutter Shiraz. Incredibly jammy on the nose; the wine is equally animated on the palate, featuring sweet ripe fruit and a spicy heat. With regards to pork, I find that far too often tenderloin is anything but tender; instead my tastes run towards fattier cuts like bacon and pork belly. Fraser does an absolutely stellar job; the pork is utterly succulent and tender while the coating adds enough flavor to let the meat stand on its own. Some felt the squash and chestnuts were overly sweet, but I thought their sweetness was nicely attenuated by the bacon and mustard. The wine, a Pinot from the Santa Maria region was a bit rounder and riper, with less sour cherry and traditional notes. 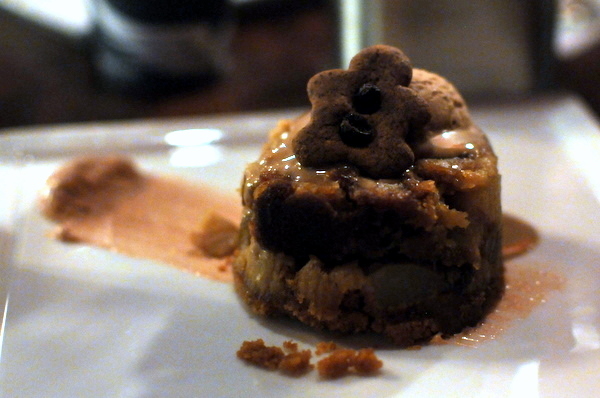 Though a bit monolithic, the dessert was softly spiced and soothing, giving it a fitting seasonal feel. 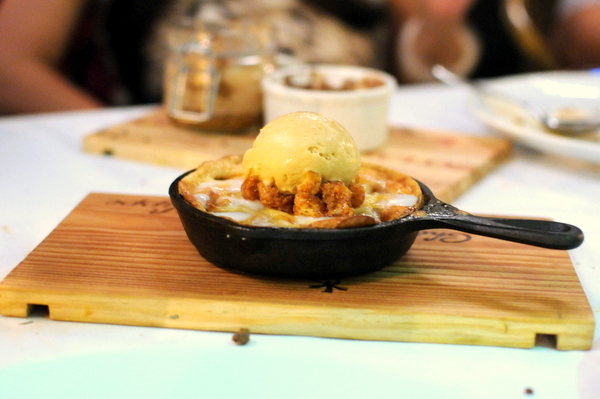 The warm cooked pair and gingerbread ice cream demonstrated a harmonious union of flavor but offered enough textural and temperature contrasts to keep the dish interesting. The pear bourbon sauce was a good idea but I wish the flavor of the bourbon showed through a bit more. 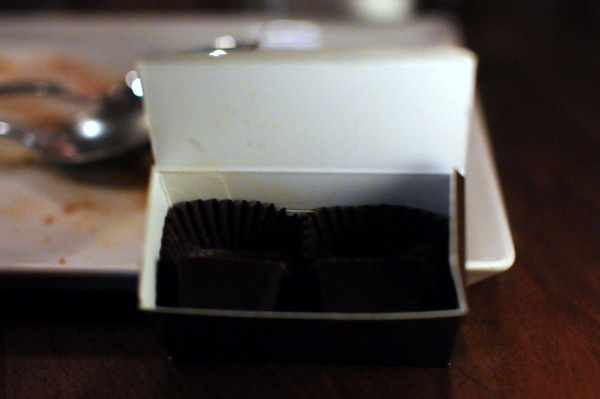 Though there were three flavors: Macallan 18, rosemary truffle, and raspberry ganache; we were only given a duo of chocolates. One was a classic combination of sweet vibrant raspberry with a finish of bitter dark chocolate while the other featured a prominent alcoholic heat courtesy of the Scotch. Fittingly the last night of Test Kitchen was also the costliest, trumping the previous record made just two nights ago during the truffle dinner. I'll say this for the Test Kitchen; they sure know how to throw a farewell dinner. 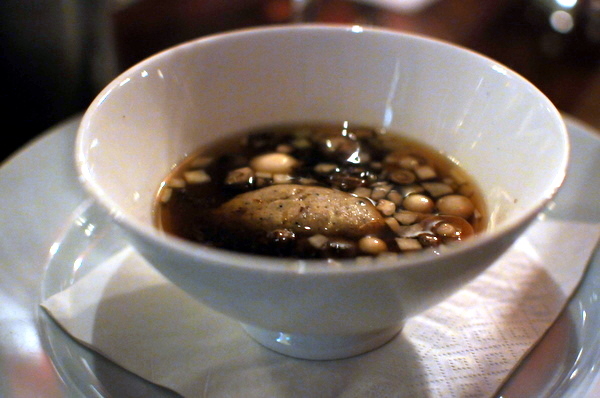 The food was arguably the best of my twenty trips, with the consommé and Turbot being the best of their kind. While it is a bit sad losing what has become a regular dining spot; I look forward to trying Picca, Sotto, and the new bar that are taking its place. 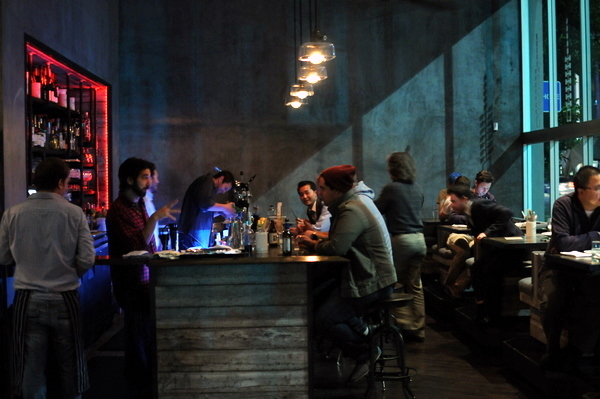 After an almost comical series of delays, Red Medicine is finally open to the public. Originally scheduled to open in July, the restaurant has faced numerous permitting and inspection issues that set them back almost half a year. 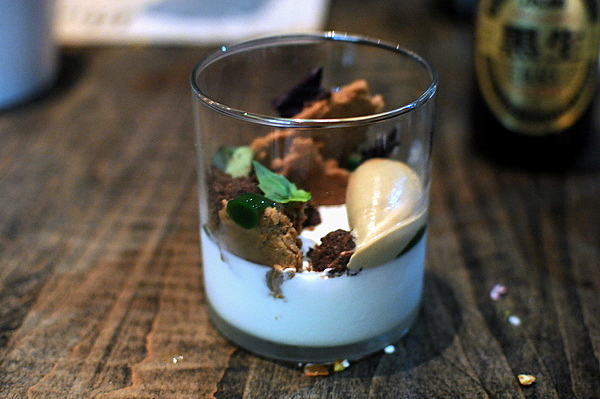 I first learned about Chef Jordan Kahn at XIV where I thought he was making the best desserts in LA. When I heard he was opening his own place I was a bit taken aback to discover the heavy Vietnamese influence on the menu. 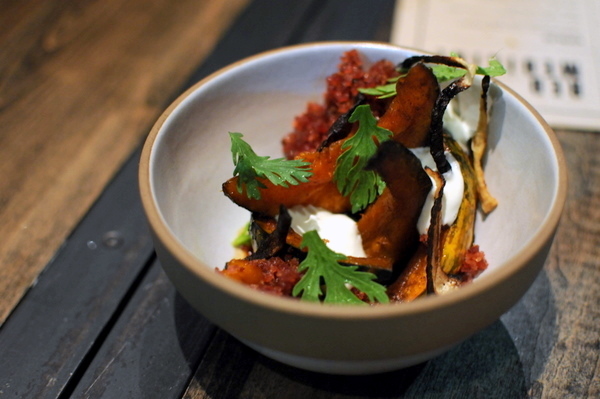 An early preview of the food at Test Kitchen helped dispel my concerns and since then Red Medicine has been one of my most highly anticipated restaurant openings. 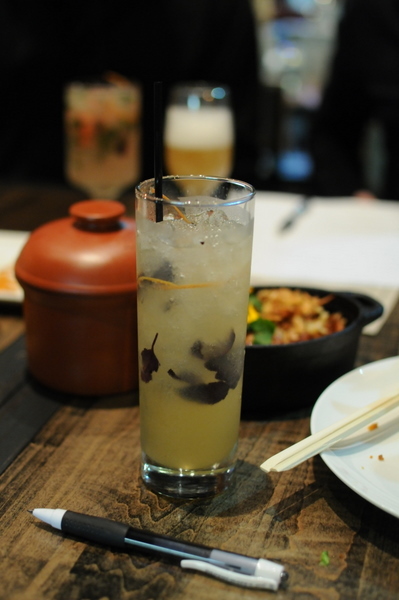 Located at the spot formerly occupied by Hokusai, the restaurant consists of a small bar/lounge area and cavernous dining room. The feel is somewhat modern and industrial dominated by weathered wood and concrete, not exactly warm but somehow well-suited to the menu. 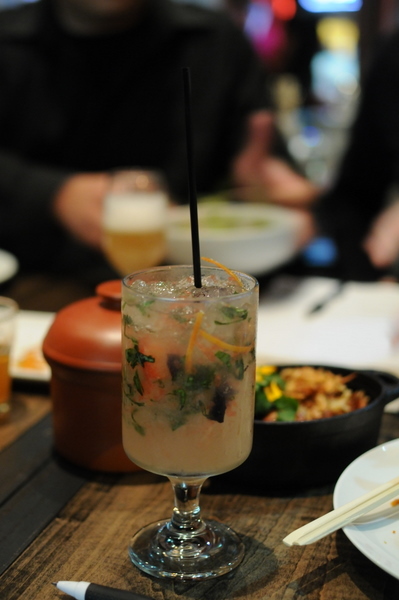 The bar area is open until 2am, a late-night industry spot for chefs where Chef Kahn can share the therapeutic benefits of Vietnamese food that he so enjoys with his peers. 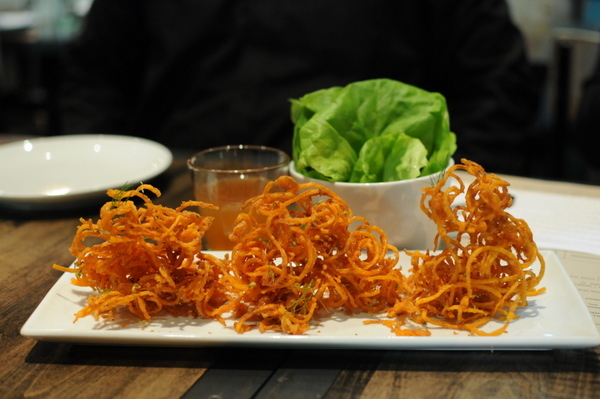 The meal started off with a bang, the strings of sweet potato are fried to perfection with a gentle fishiness courtesy of the dried shrimp. Delicious on its own, the potato is taken to another level after a quick dunk in the fish sauce whose bold pungent tang contrasts and highlights the natural flavor of the potato. Apparently Pintade Fermiere is a type of Heritage Guinea Hen prized for its exceptional flavor. Chicken and caramel was a new combination for me, but it works, the caramel gives the bird a flavor reminiscent of brown butter, rich and slightly sweet with a subtle coriander tinged aftertaste. 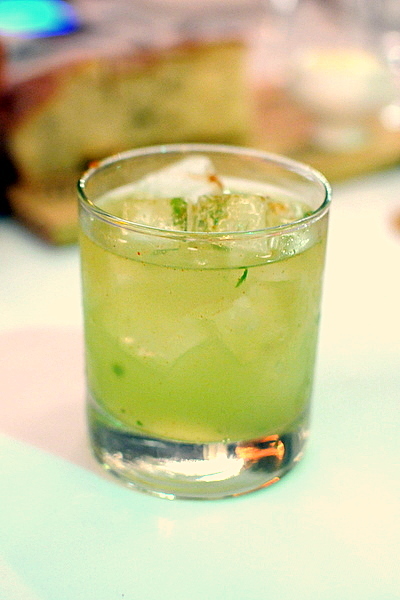 This was one of my favorite libations of the evening; the drink is restrained with nuanced hints of bitterness, tangy sweet fruit, and alluring basil. This was probably the strongest cocktail; bright and refreshing courtesy of the basil and citrus coupled with a subtle effervescent sting from the ginger beer. 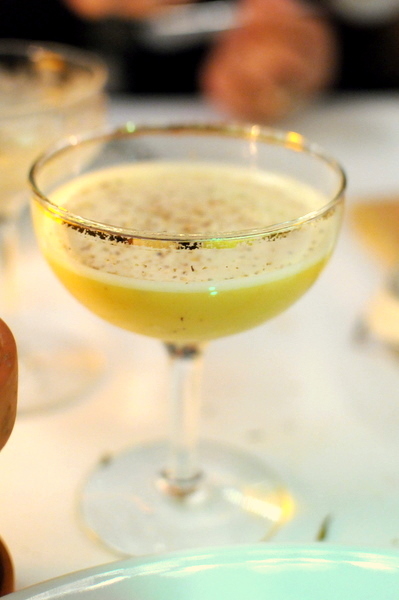 One of the bolder cocktails of the group; all ripe apples and heat with a grippy texture from the egg white. Beer with ice was a rare experience for us; my companions zeroed in on the watery feel but I thought the combination tasted almost like an iced tea. 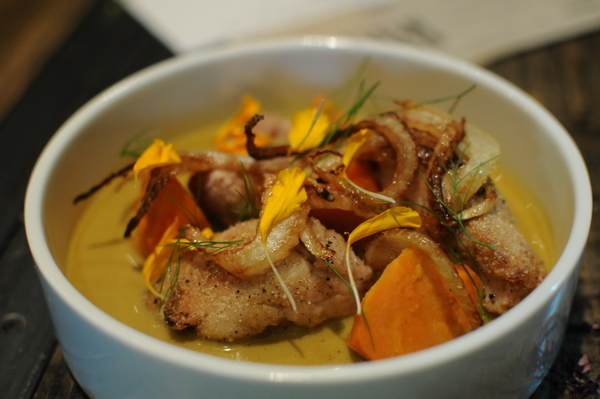 The fluke was probably the strongest course of the night with vivid flavors interleaved in a high energy dish. 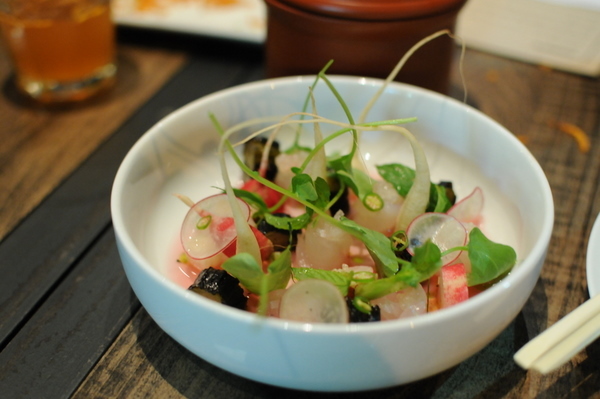 The crunchy bitter radish and sizzling heat of chili slices are evenly matched by the gently saccharine sauce and enchanting pop of citrus from the finger lime kernels. 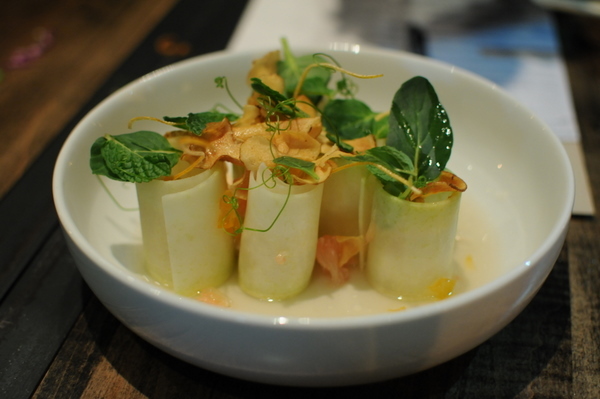 The minimalist radish-centric spring rolls were a far cry from the variation on goi cuon that I was expecting. 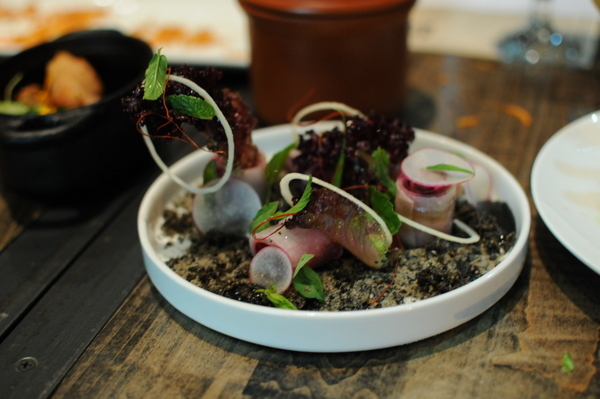 Still this proved to be a superb dish, highlighting the revitalizing properties of crisp pickled radish juxtaposed with a sticky-sweet sesame sand. 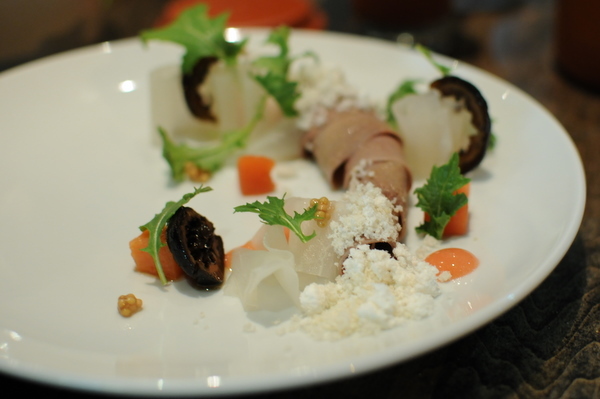 If one course exemplified what Chef Kahn was trying to accomplish with Red Medicine it is this. 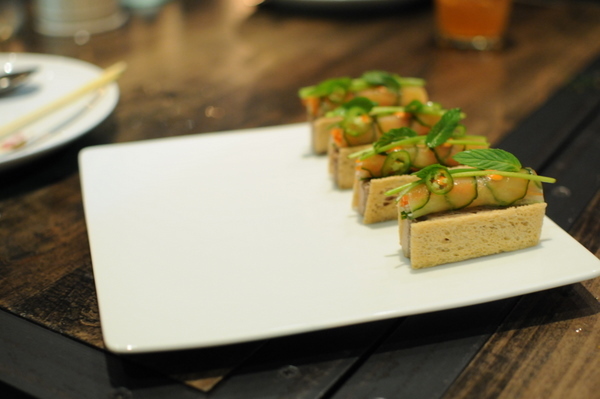 The pickled vegetables and pate capture the essence of Banh Mi while the exceptionally flavorful foie gras marks it as a world apart from the traditional preparation. 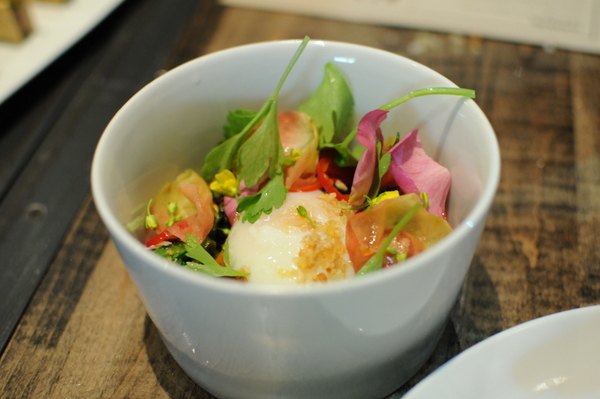 The eggs were sourced from a farm run by the mother of one of the chefs, hence the name of the dish. After the meal Chef Kahn told us an amusing story of how they fed the chickens Thanksgiving dinner food hoping to influence the flavor of the eggs. Though the experiment was a bust, but in terms of flavor the dish was anything but. Breaching the perfectly poached egg adds a gelatinous coating that tempers the bitterness of the various brassica greens, very reminiscent of the way my parents would serve he bao dan over rice and veggies at home. Given my aversion to papaya I never expected to like this course let alone consider it one of the evening's best. Instead of cloying, the strips of fruit are taut and vivacious, beautiful in conjunction with the sweetened tree nut and the crisped lightly salted taro chips. The first of three very strong beef courses was the bavette, a flank steak with with the perfect amount of scoring on the exterior and a a mouth-wateringly succulent interior. The robust beef flavor is complimented by a potent bacon XO and tangy soft eggplant. 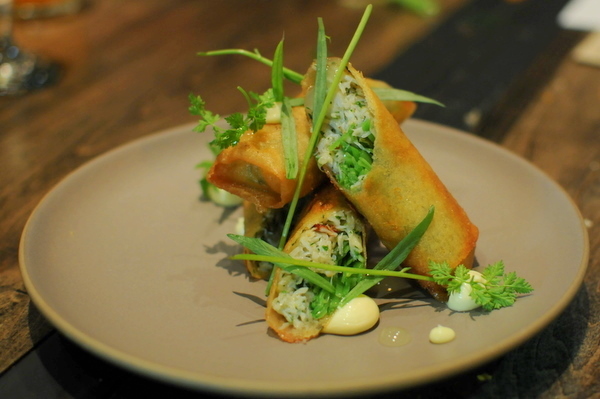 The crispy spring rolls followed a more traditional formula, blending a crisp sapid exterior with a filling of sweet crab meat. The weight of the dish is deftly tempered by the application of sweet calamansi and fragrant herbs. 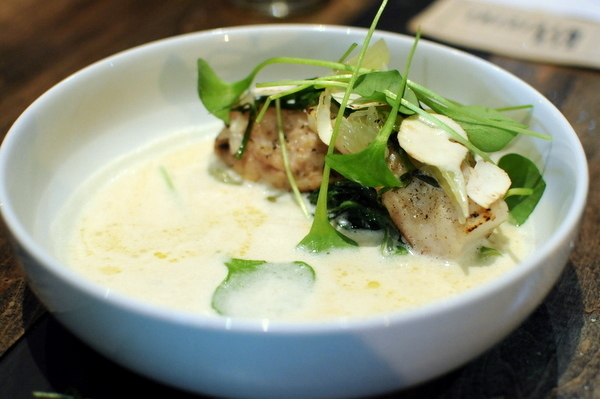 The flavor of the sweetbreads are lost against the heady coconut laced curry though Chef Kahn explained that they were more for textural purposes anyway. In the end, I found myself sopping up the spicy-sweet sauce with big pieces of the toasted baguette. Kohlrabi or German turnip is a variety of cabbage with a flavor that I could only describe as a cross between apple and turnip. 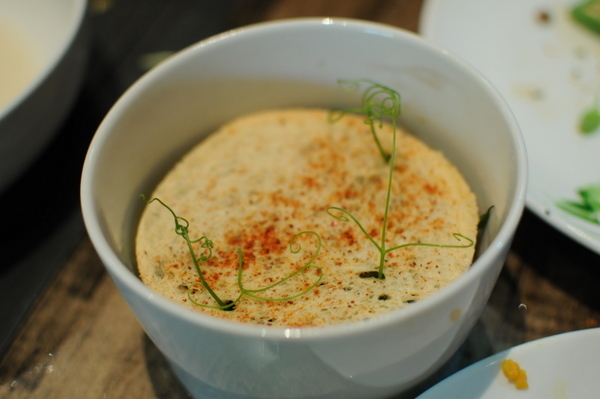 The lightness of this dish was the ideal foil for the curried sweetbread, crisp and vegetal at the outset with a delicate tofu center that was almost milky in consistency. 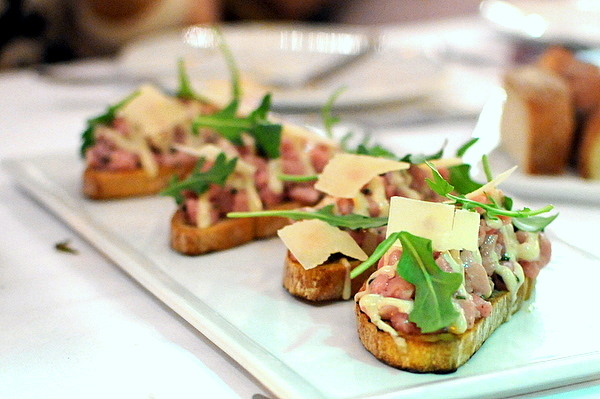 The tartare has grown and evolved since the last iteration. 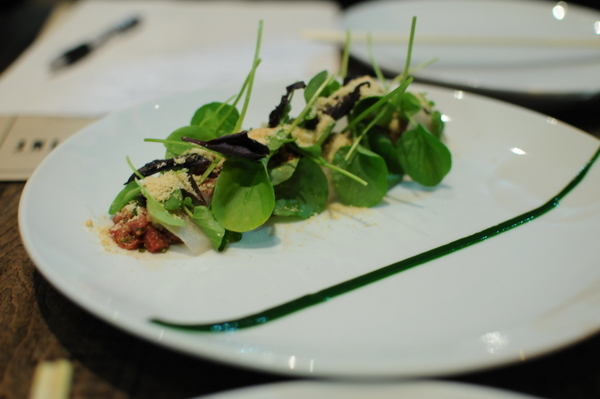 The beef is equally snappy and toothsome, though the accouterments have grown markedly, the mustard leaf and water chestnut provide a multifaceted crunch as well as a barely noticeable trickle of spice that built to a pleasing numbing heat on the finish. A simple dish of sauteed vegetables that would be right at home in any good Asian restaurant, the vegetables picked up a subtle flavor that I can only describe as the result of being cooked in a well used wok. Though I found the texture of the dumplings a bit dry, the pork fat certainly gave the meat a transcendent flavor. Again the use of acidity and herbs helps provide a countervailing lift against the weighty pork fat. The smoky pork rilette would have been perfectly at home in a banh mi, but on its own, the chaud-froid felt a bit monolithic, even when taken with the accompaniments. 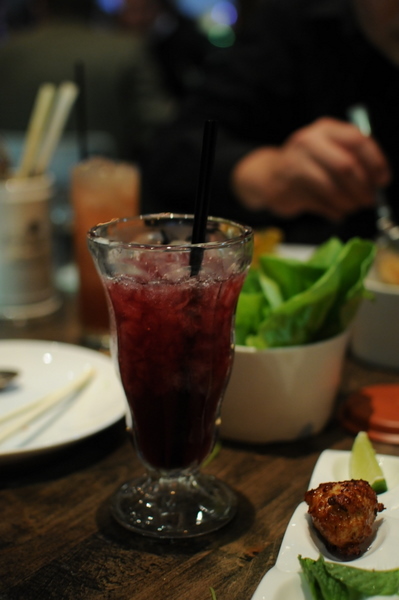 This cocktail tasted heavily of the rum, dominated by dark fruit with an overarching essence of banana. The most approachable drink of the evening, the sparkling lemonade adds a tart fruity levity to the drink that one of my companions likened this to a sangria. 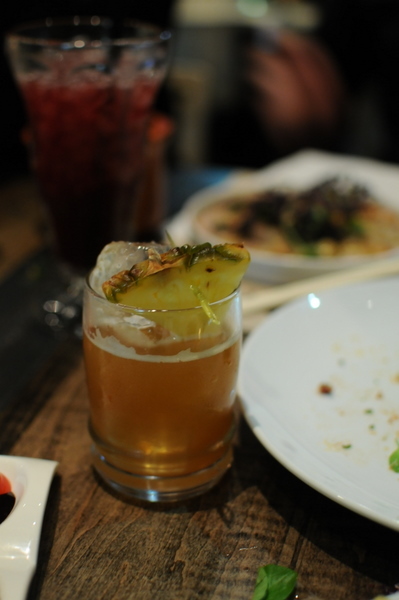 The blend of spiced gin, rum, and pineapple dominate giving this drink an animated tropical character reminiscent of a Mai Tai but with more complexity on the finish from the bay leaf and bitters. 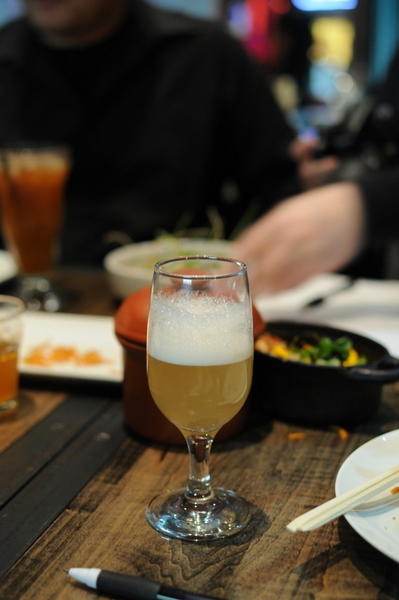 Another repeat from the Bo 7 Mon dinner, the calve's tongue was even more tender this time around almost ethereal, dissolving on the tongue and leaving behind a smoky aspect. 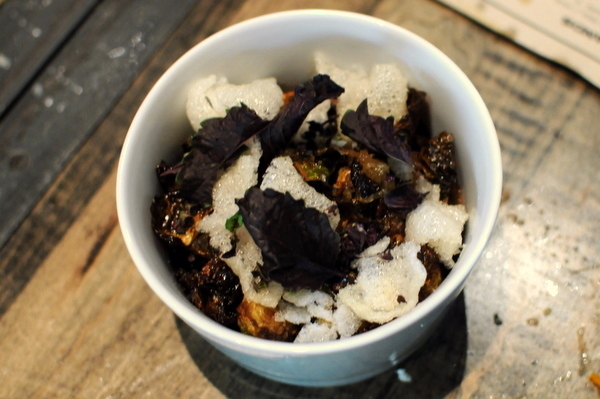 The etherealness of the tongue demanded bold textural contrasts which comes in the form of crispy daikon and sandy powdered walnut. I wish this came earlier in the meal as I find the vegetal smokiness of shishito peppers help whet the appetite. I appreciated the textural element provided by the coating of almond crumbs on the peppers as well as the subdued ripe sweetness of the soft cooked fruit. The incomparably tender duck almost fairly melts on the palate with a flavor reminiscent of roast duck. The depth and complexity of the pronounced bitterness of the frisee is nothing short of awe-inspiring. The bitterness of the lettuce is the perfect accent to the duck adding a BBQ-like rustic feel to the bird. 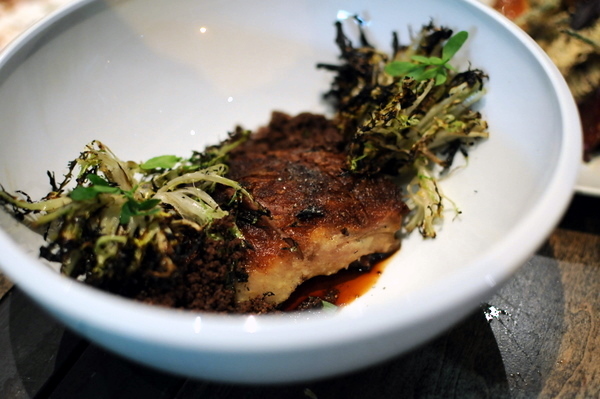 The striped bass felt overly dense and blunt; though the heady melange of brown butter and soy milk helped matters somewhat, infusing the fish with succulence and flavor. This was one of the rare times I actually could have done without the citrus, finding the flavor disconcerting when taken with the rich broth. Ironically my companions who actually like brussel's sprouts weren't fans of this dish but I quite liked it despite my general disdain for the vegetable. The sprouts are heavily charred but seasoned with a generous application of fish sauce, the ensuing funky char coupled with the shrimp chips blunted the worst of the brussel's sprouts natural bitterness. 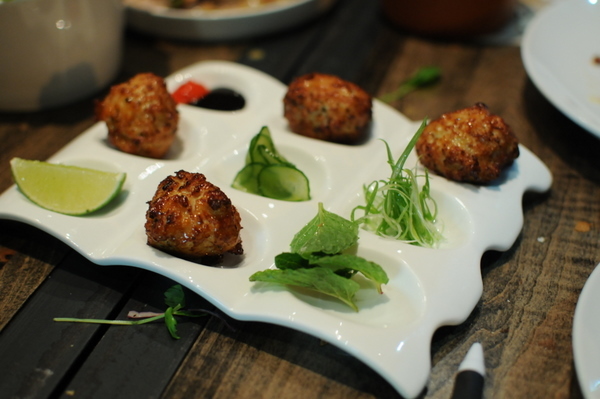 The use of larger scallops might have been in order as the bay scallops felt a touch overdone. Still they possessed a markedly pure flavor that was amplified by the bitter tang of the radishes. Even though I was hurting by this point I still thoroughly enjoyed the fork tender pork. 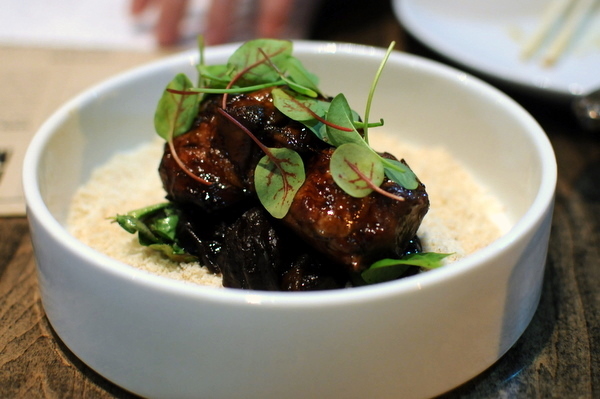 The pork had a generous layer of fat that imparted a heavenly unctuous aroma balanced by a thick glaze of vinegar and honey and further tempered by the ripe jammy prunes. Kabocha tends to be a little sweet for my tastes and that proved to be the case here. 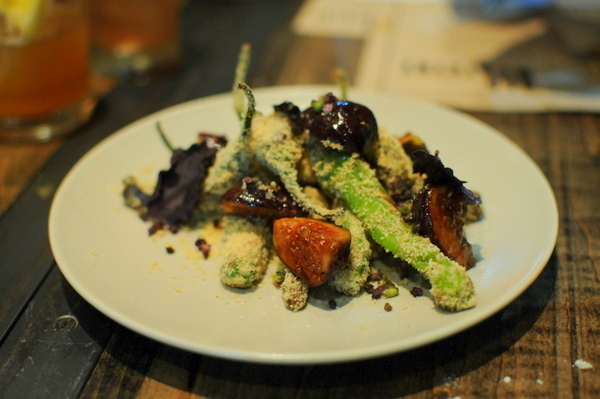 The mealy texture and saccharine flavors were particularly difficult given how full we were. I had hoped the Chinese sausage would provide a porcine moderating element but it just wasn't strong enough to compete with the squash. Here we come full circle, for the final savory course of the evening we again have lettuce wraps and fish sauce but this time the filling is a decadently fatty cut of brisket. The beef itself is fantastically heavy, loaded with a gaudy amounts of fat making the pickled radish and cucumber a must. Despite being full to bursting I found myself craving one more bite. 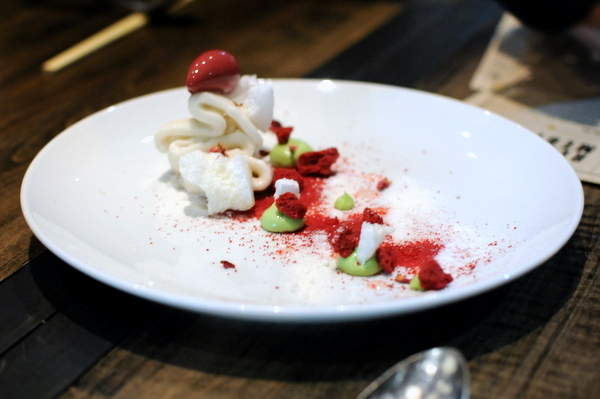 With Chef Kahn at the helm, Red Medicine is one of the few restaurants where the desserts could quite possibly outshine the savory food. 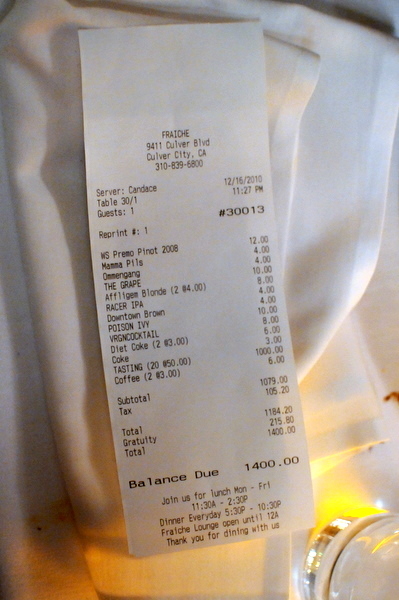 With that in mind, we made it a point to order one of each dessert though we were already bursting full. 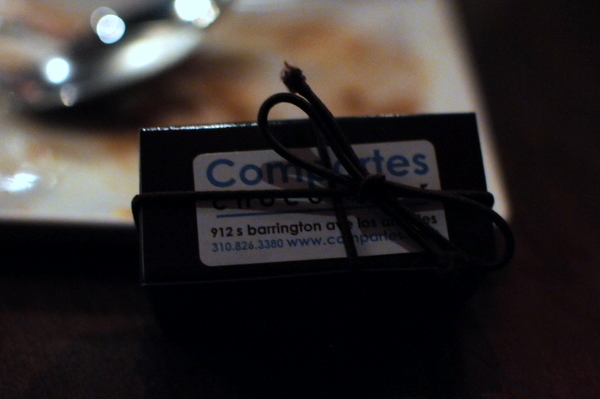 First up was a uniformly smooth pots de creme, imbued with the elegant flavor of lemongrass. I never would have imagined dessert with Red Bull, but its medicinal flavor fit quite nicely with the herbal tones of the lemongrass. My favorite part of the dessert were the light brown nuggets that tasted like chocolate chip cookie dough. I mistook this for the dessert I had at Test Kitchen but any similarities ended with the similar visual presentations. 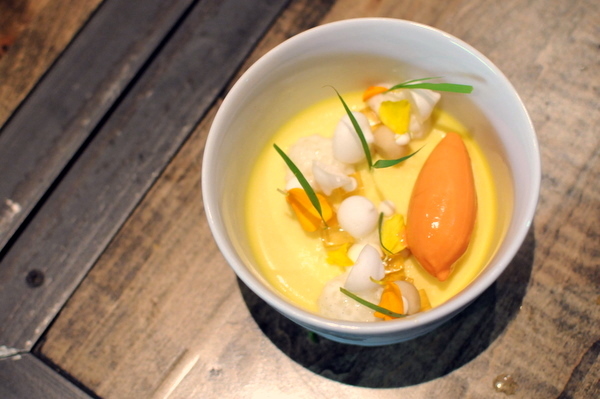 The dessert itself was markedly heavier, consisting of a base of coconut flavored Bavarian cream and topped with a dizzying array of textures and bold flavors. The dessert is so complex that it is difficult to succinctly describe the sensations the dessert provides, rather I suggest you try it for yourself. The third dessert felt like an intermezzo of sorts, the black currant and lychee are both very vivid but yet distinctive. 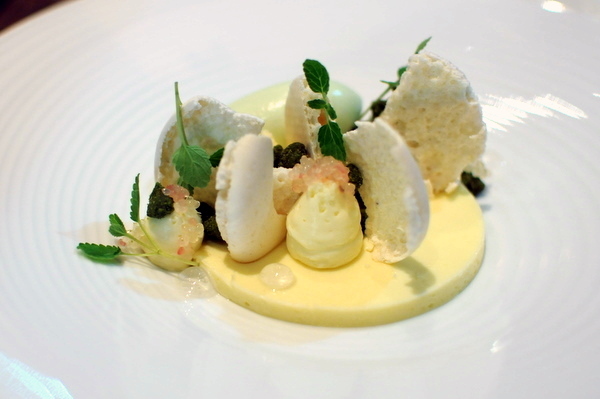 The dessert also features a meringue-like bits that contrasted nicely with the creamy soft texture of the sorbets. Also, chalk it up to Chef Kahn's superlative pastry talents but this was the first time that I've had an avocado ice cream that I didn't find off putting. 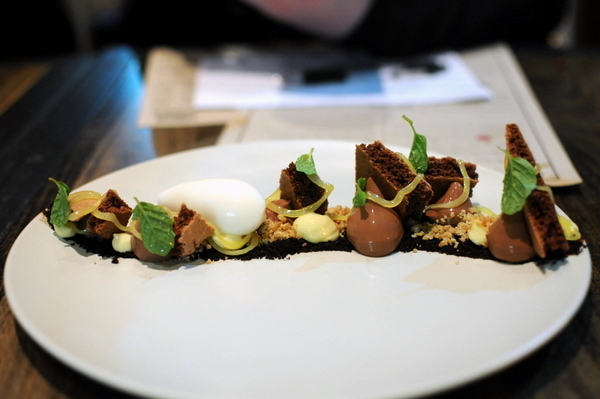 Chocolate and soy sauce, daring and just what I would expect from someone of Chef Kahn's caliber. Moreover, this is one of the most intricate chocolate desserts I've ever tasted. 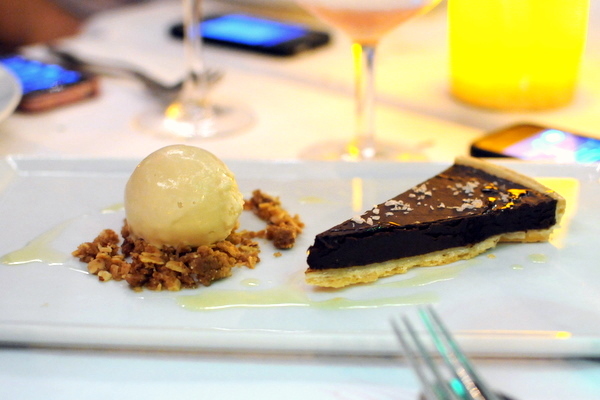 The chocolate is well expressed in this dessert, but not so powerful that it overwhelms the rest of the dessert. The kecap manis provides an esoteric savoriness and tarry color while the pear, parsnip, and oats provide balance to the heft of the chocolate. I had a fantastic variation of the Lime Sabayon during Chef Kahn's second stint at Test Kitchen and if anything the dessert has become even more elegant and sophisticated since then. The combination of light citrus, vegetal cucumber, and fragrant jasmine evinces an airy grace that made this the strongest dessert I've had in a long while. 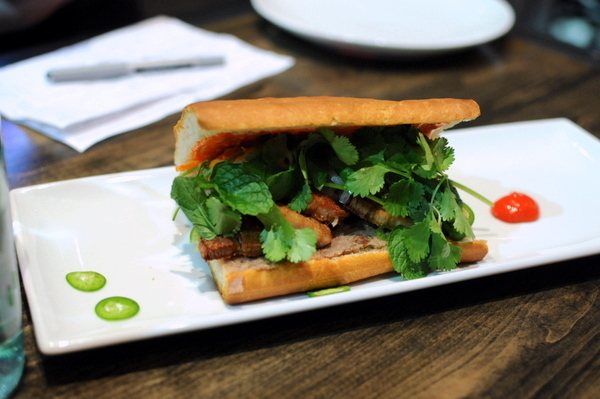 This was probably the best Banh Mi I've ever tasted. Yes the price is substantially higher but the quality and technique shown here isn't something you could find at your typical Vietnamese restaurant even at five times the price. In particular, the warm pate and pork belly ooze richness while the liver in the pate gives it a commanding flavor that I've not seen anywhere else. 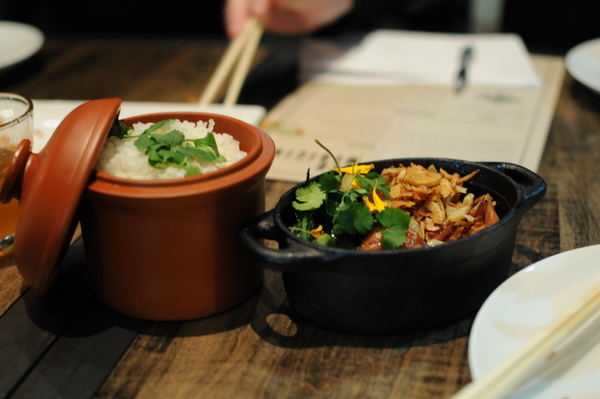 "This is not a traditional Vietnamese restaurant." Truer words were never spoken. 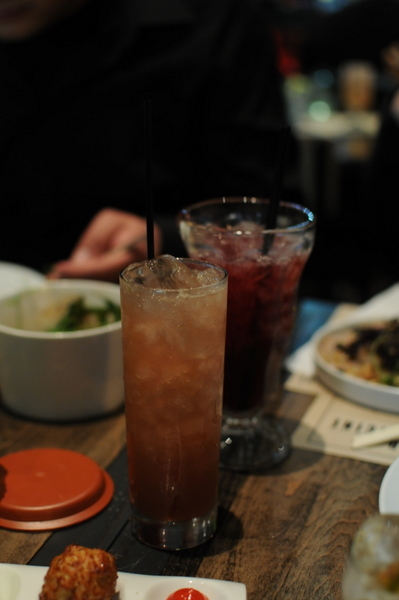 Red Medicine's manifesto starkly declares this to be a breed apart from your traditional Little Saigon eatery. 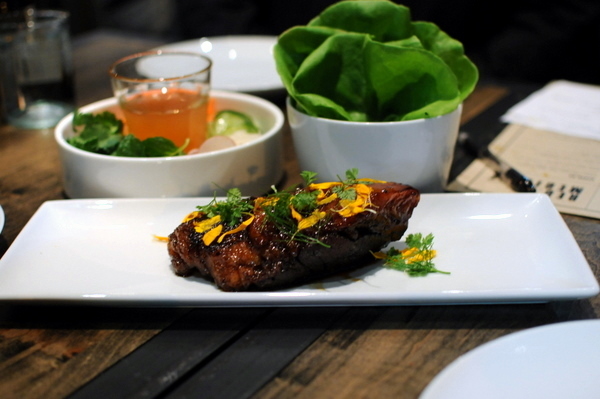 Rather the restaurant is a chance for Chef Kahn to take those distinctive flavors from Vietnamese cuisine that so captivated him and apply them to a whole new realm of cooking. The execution was remarkably polished for the first night of service, with the kitchen adapting the flow of food to match our pace with little difficulty. More importantly the food itself is superb and proved to be more than worth the wait. 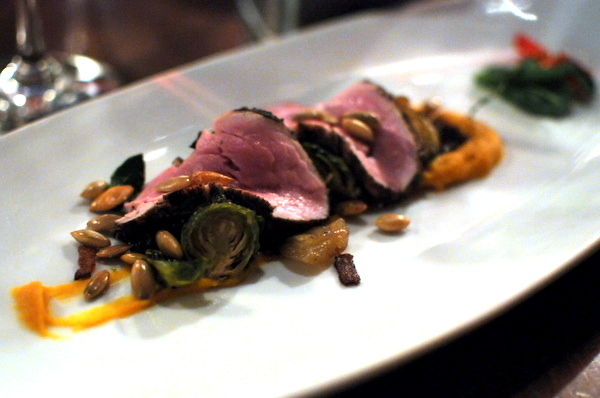 I look forward to taking Chef Kahn's advice to come back again, sans camera, and just enjoy the food.